This track leads into the northern side of the Wyperfield National Park. It is an ideal way to drive into the lovely Casuarina campground, that is about 28km from the park entrance. This entrance is 13km south of Underbool on the Mallee Highway. The track provides some soft sand driving that is jsut deep enough to be interesting. I found it quite soft in summer, making the motor work reasonably hard, but on the last drive in the winter, after good falls of rain, it was somewhat easier. 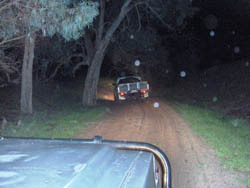 There were are few muddy patches, but on the night we went through they were quite small and not any problem as far as stranding a vehicle is concerned. This track is through small sandhills, and has an open view across a dried lake bed to the west, providing relief from the thick eucalypt coverage on the eastern side. We saw many kangaroos as we came into the park after dark. A very enjoyable drive. We found our way through to the Casuarina campground by following this track to its end, 18km south of the park entrance, where it meets Snowdrift Track. We turned left onto Snowdrift Track. After 3.4km the Snowdrift track ends. We stayed left at this intersection, with Wool Track, and contiunued on a further 4km to another intersection. Here we turned right onto Meridian Track and after driving 5.8km we arrived at the Casuarina campground. ( A short cut would have been to turn right at the Wool Track, and cut through to the Meridian Track. This saves 2km, and is a more scenic drive. This campground has many sites, each with a table and a fire place with a steel weathershield on three sides and a lift up BBQ plate with grill. There is ample firewood available from the many fallen trees scattered across the open ground surrounding the camp site. Many mature Cyprus Pines are scattered through the campground to provide shade and a pleasant outlook. There is a track that connects all of the camp sites in a large circle around the toilet block. There is a rainwater tank collecting from the toilet roof. I have camped here twice and have found it quite peaceful, with just two other vehicles on each occasion, both times in the school holidays.